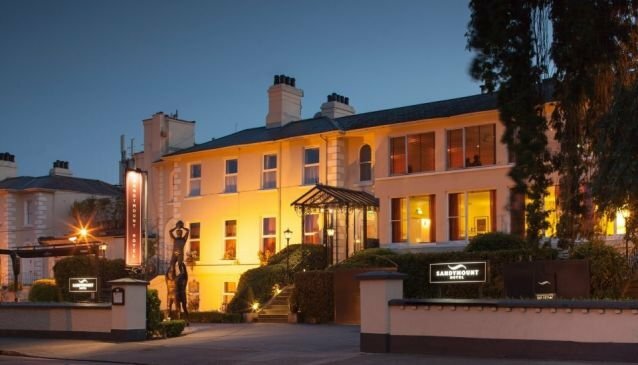 Located between Ballsbridge and Sandymount in Dublin 4, the Sandymount Hotel is made up of eight Victorian houses, sited on the Old Haig's Distillery (1795-1840s). Even though the Sandymount Hotel is virtually in the shadow of the Aviva (actually the closest hotel to the stadium) and convenient to other major venues in the area, it's still only two DART stops away from the city centre. The Sandymount's stylish, contemporary guest rooms offer an 'oasis of calm' in the bustling capital. Comfortable furniture, modern artwork and chic soft furnishings feature throughout. Conscious that each guest has their own particular requirements, the Sandymount Hotel proudly offers a selection of room types including 151 classic rooms (single/double occupancy or spacious triples), three large family rooms and 12 stunning executive rooms (all executive rooms are located on the top floor of the hotel to ensure maximum peace and quiet). For those seeking something extra special, there are two beautifully appointed junior suites. The Sandymount Hotel also offers drinking and dining options on site. A full Irish buffet breakfast is served in the Cordyline Restaurant each morning, and the laid-back Tritonville Bar & Terrace serves lunch and dinner daily. If it's a nice day, you might even enjoy a quick bask with a pint on the terrace if the sun is shining! Only a few minutes' walk from the hotel is Sandymount Village. Known as the birthplace of WB Yeats, the appealing village provides everything from gift shops and boutiques to bakeries, cafés, restaurants and bars. Surrounded by some of these eateries, the well-kept triangular Green in the village's centre may be on the small side, but it's a pleasant spot to visit in fair weather. And there's other options on the doorstep - you might join a Stadium Tour at the Aviva next door. Or if you enjoy the beach, the Sandymount Strand is an excellent place to stretch your legs and take in some beautiful scenery. Another plus - for any traveller, not just those staying on business - guests have free access to the Business Centre at Sandymount Hotel, a quiet dedicated space with facilities including WiFi and printing. The Sandymount also boasts nine meeting rooms (from executive boardrooms for 10 delegates to large conference suites which cater for up to 100).